Montgomery County has an extensive tree canopy, but it's under threat. Trees are an important part of any urban environment, providing shade, oxygen, and even calming traffic. Of course, they're also great to look at. As a result, protecting and expanding Montgomery County's tree canopy has been a growing issue in recent months. A study done by the University of Vermont for the Montgomery County Planning Department found that while half of the county is covered by trees, the county's urban areas have a much smaller tree canopy. 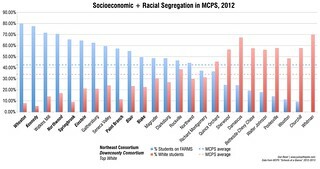 Just 19% of White Flint is covered by trees, while downtown Silver Spring has a 14% tree canopy. 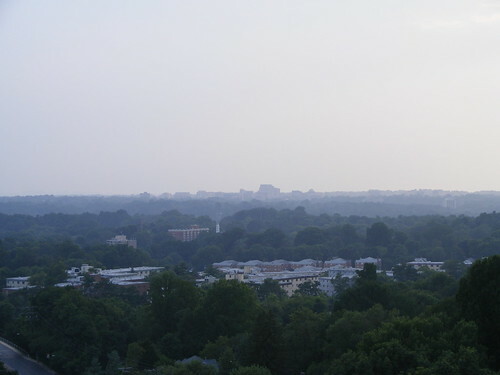 The smallest tree canopy was found in the Montgomery Hills business district south of Georgia Avenue and the Beltway, which has just 8% coverage. Urban areas should have at least a 25 percent tree canopy, planners say. 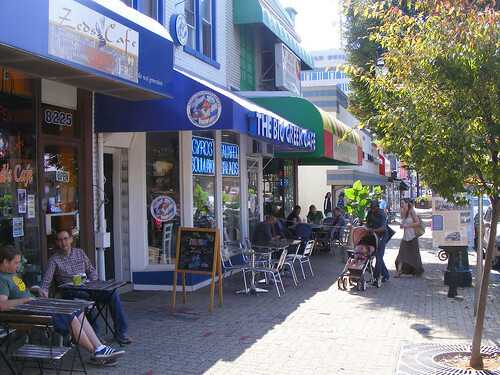 One of the best ways to expand our tree canopy in places like downtown Silver Spring or White Flint is by planting more street trees next to sidewalks and in medians. Trees can provide significant health benefits and can even be an economic windfall for places with more of them. 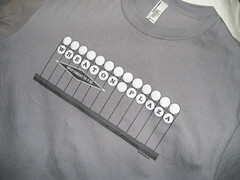 A 2001 survey of Wheaton residents found they overwhelmingly preferred streets with trees for downtown Wheaton. According to urban designer Dan Burden, spending between $250 and $600 to plant a tree can yield up to $90,000 in economic benefits for the surrounding area. Studies show that street trees have health and economic benefits. For decades, transportation planners saw street trees as a safety hazard because they blocked drivers' vision. For that reason, County Executive Ike Leggett actually recommended removing street trees from busy roads in 2008. However, we know now that trees can "reduce the 'optical width'" of a street, slowing drivers down and making it safer for everybody. 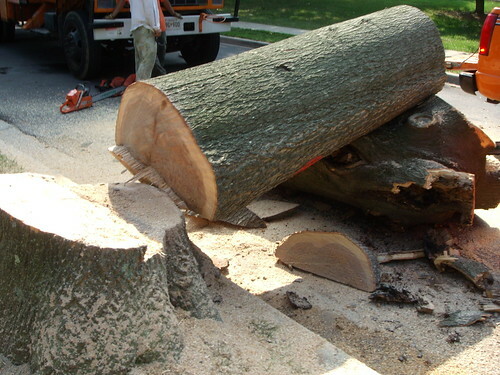 Today, there are multiple efforts to add more street trees in Montgomery County. This fall, the Planning Department introduced a program called Shades of Green that provides free shade trees and two years of care to eligible property owners in downtown Silver Spring, downtown Wheaton and Montgomery Hills. 30 trees have already been planted under the program in those three areas. Nonprofit group Conservation Montgomery has been organizing tree plantings of their own. Last month, they teamed up with Casey Trees, a forestry organization based in the District, to plant in Montgomery Hills. They've also received grant money in partnership with fellow nonprofits Safe Silver Spring and Uno Granito de Arena to plant trees in Long Branch. Pepco workers cut down trees on East-West Highway in Silver Spring. Photo by Gull. Unfortunately, these efforts are undermined by poor maintenance of our existing tree canopy. After heavy storms last year, Pepco began trimming trees in earnest before falling branches could take down power lines. According to their website, Pepco uses nationally-recognized standards and practices for tree trimming, but residents complain they're being too aggressive, mangling trees and trespassing on private property. 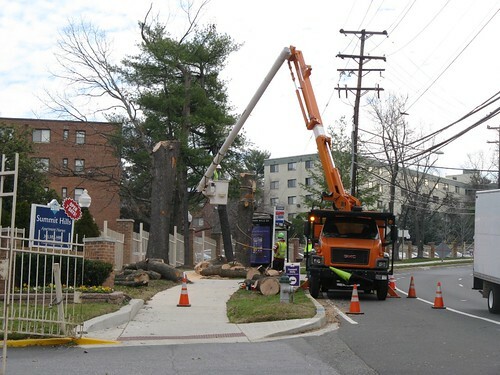 Downtown Silver Spring resident Gull sent us some photos of Pepco workers cutting down trees along 16th Street and Spring Street last month. In an email, he called it a "serious quality of life issue" for him and his neighbors. "It's very easy to see into communities, houses and apartments that were once obscured from view," he wrote. "I see it as a big problem that instead of planting more trees in our urban areas, we're removing them and making above ground utilities the primary thing visible to us." Last spring, County Councilmembers Roger Berliner and Marc Elrich drafted a bill that would set higher environmental standards for tree trimming and require power companies to ask homeowners' permission before doing any work on their property. However, the bill was deemed unconstitutional and set aside after the derecho storm in July brought down power lines and knocked out power to thousands of residents. A felled tree next to a house being built in Chevy Chase. New legislation aims to help protect or replace trees like this. Since then, the council has introduced two new pieces of legislation aimed at protecting trees. Bill 35-12 would require property owners cutting trees down on smaller lots to pay into a fund dedicated to replacing those trees. The county's Forest Conservation Law already requires this on lots over an acre in size. Another, Bill 41-12, would require a permit to do work in a public street that might damage a tree. They've set a public hearing later this month to hear testimony about both bills. The legislation has support from Conservation Montgomery and the Montgomery Countryside Alliance, but has gotten a lot of pushback from local home builders. Renewing Montgomery, a group of small home builders, argued that the original bill proposed last summer restricts the rights of property owners. As our urban areas grow, there's an inevitable tension between the built environment and the natural environment. However, protecting our tree canopy has many benefits for people as well. Whether by planting new trees or preserving old ones, we can make our communities healthier, stronger and more prosperous. The County Council will hold a public hearing on both bills Thursday, January 17 at 7:30pm at the Council Office Building, located at 100 Maryland Avenue in Rockville. For more information and to sign up to testify, visit their website. You can also sign Conservation Montgomery's petition supporting both bills. And if you'd like to learn more about the tree canopy in your neighborhood, check out the Planning Department's tree canopy explorer.